Fonthill Castle is a Gothic Revival hammered stone structure built to recall a castle, built along the Hudson River as the Hudson River Railroad planned to lay its tracks, composed by a cluster six octagonal towers, the name Fonthill was derived from William Beckford's Gothic Fonthill Abbey in England it was commissioned in 1852 by Edwin Forrest, a successful skakespearean Actor, as the private home for himself and his wife, the couple never got to live in the building. Forrest later sold the property to the Sisters of Charity of New York who relocated the Academy of Mount Saint Vincent from McGowan's Pass when the City of New York was developing Central Park. 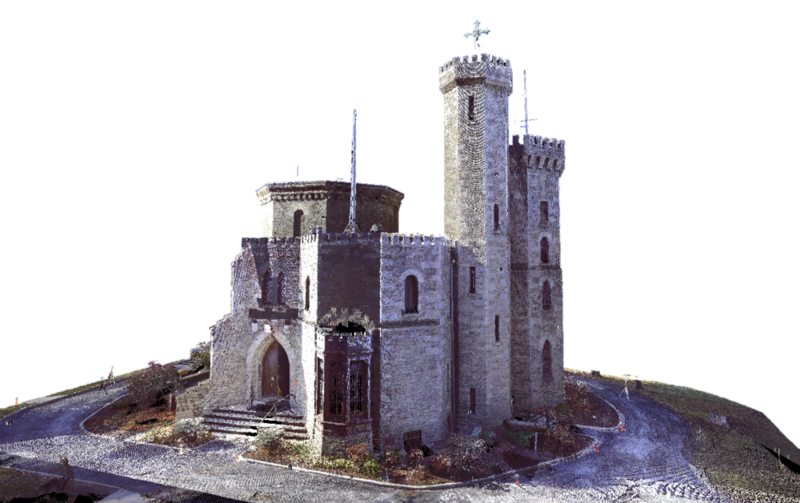 The castle has served as a convent, chapel, museum, chaplain's residence, and the college library, without any significant modification made. The structure, which is now a National Historic Landmark. its curious history, (the Sisters were essentially the single user), preserved the overall integrity of the exterior and interior, which is however in great need of restoration and infrastructure upgrades. TRA studio was charged in 20016 to start the process to document the building and prepare a complete Condition Report for the Restoration, TRA also prepared a concept design for the redefining the surrounding areas, in a way restoring the connection between the building and it surroundings. 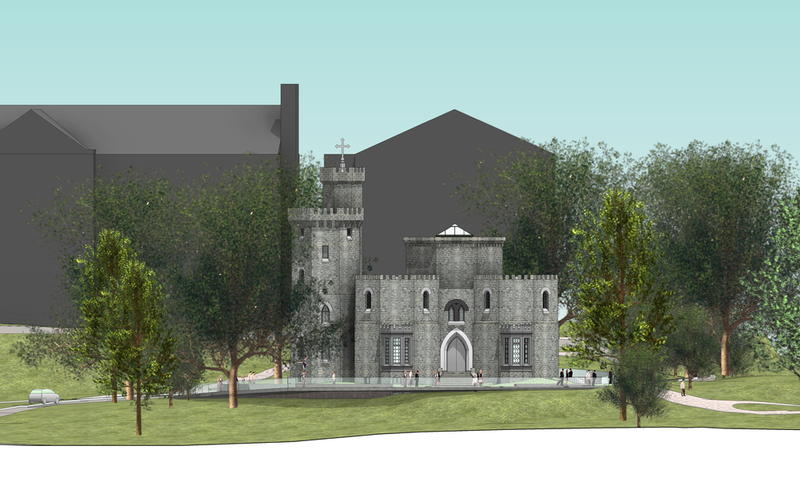 TRA Studio is in the process of crafting a restoration plan for the historic structure, whose TRA is also in the process of redefining the landscape connecting the structure to the other major buildings on Campus. 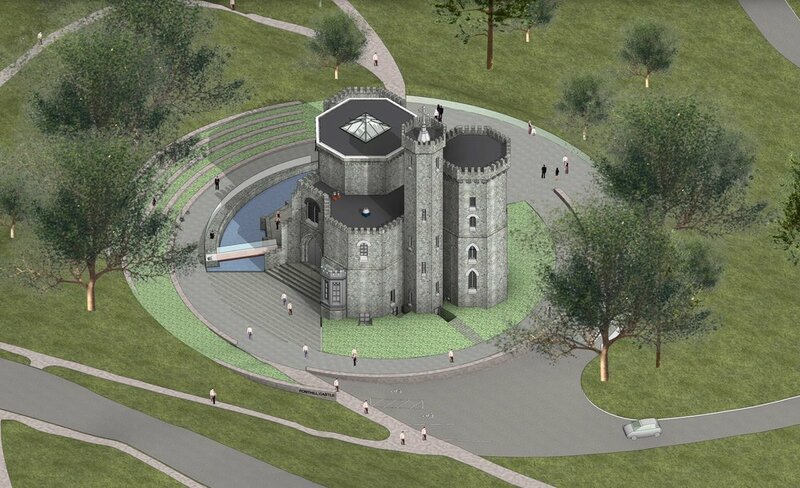 The proposed landscape design takes its clues from the original print showing a perfectly circular lawn surrounding the castle, suggesting an abstract moat around it. The proposed scheme proposes a circular defininig moat which takes the place of the present asphalt cul de sac road, also acting as a retaining basin to manage runoff. A minimal gentle circular ramp accompanies the moat, gently leaning over the pre-existing steps to the outdoor stage that Forrest had envision for his own performances, the gesture allows for handicapped accessible access without marring the existing individual Landmarked structure in any way. The geometry of the moat expands in concentric circles creating an open amphitheater around the open stage. The terraced landscape climbs up the hill, connecting the castle to the Main Building. An open cantilevered terrace for hosting events occupies the Hudson quarter of the circle, while the necessary parking is hidden away downhill. The proposed main interventions pertain, as previously mentioned, to the handicapped access to the main floor and subsequently to the upper floors.. The service spaces, such as the kitchen for events, storage and mechanical, take advantage of the less accessible spaces, such as the basement, (where the irregular foundation even boasts exposed rock boulders) and the portions of the turrets that cannot be publicly used, due to the lack of means of egress. The simple, concise, minimal geometry which originates from the Fonthill Castle rotunda radiates, in a spinning movement, to engage the campus at large, from Founder’s Hall to the River, becoming its campus connector. One of the paths takes to the old Railroad tracks, which hopefully one day will reconnect the Hudson Valley to the City. Instead of the function defining the form, in this case the form dictates the function. The floor plan is a porous cluster of six octagonal towers, no corridors and wasted space, making it ideal for exhibition or event space, accessed from all 360 degrees from all the major buildings of the campus and connect vistas from the Administration Building to the Hudson River and to the Community at large. The compact floor plan, almost absent of corridors, makes for the perfect exhibition and performance space, without much intervention. The eccentric floor plan promises, in the second phase of the project, to make it the ideal hub to foster sociability and provide a reference point that symbolizes the togetherness of all the different departments populating the campus site.